Today we are sharing a moist and flavorful homemade Banana Cake recipe that is truly the BEST! Even better, we’ve paired it with a heavenly butter pecan cream cheese filling. If you’ve been searching high and low for the PERFECT scratch banana cake recipe, congratulations! You’ve just found it! I’ve always loved banana bread, and this amazing banana cake recipe captures all of those wonderful flavors, but in the form of soft, ultra moist cake layers. 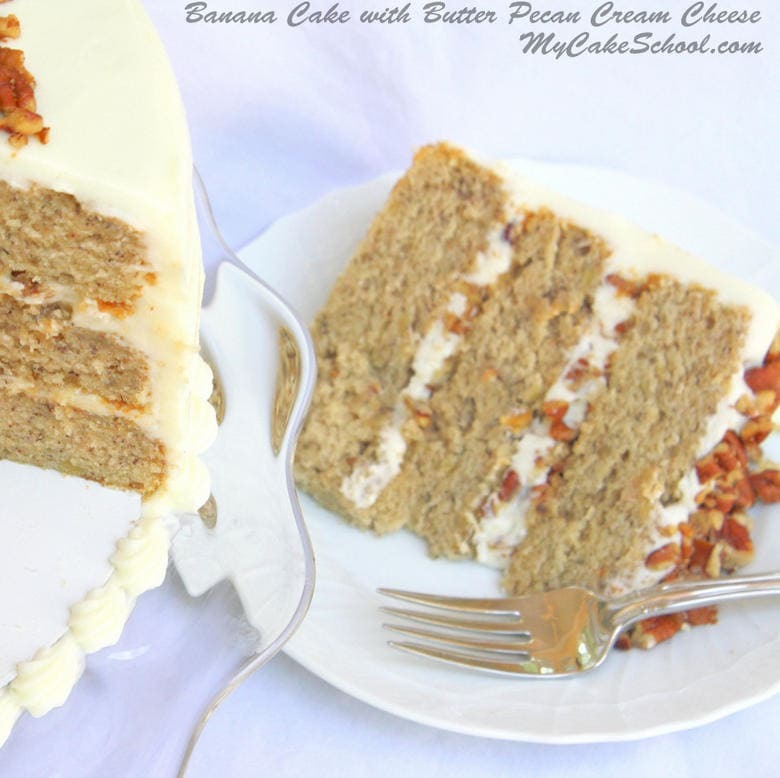 While this particular banana cake recipe is flavorful enough to enjoy all on it’s own, our Butter Pecan Cream Cheese Filling takes it to an entirely new level of AMAZING! The combination of banana cake paired with cream cheese and butter pecan is a match made in heaven. We opted to frost our Banana Cake with luscious cream cheese frosting…mmmmm. I find that there’s NOTHING that doesn’t taste even better with a good slathering of cream cheese frosting. This Banana Cake is the perfect recipe for fall gatherings or Thanksgiving celebrations, but your family and friends are sure to beg for it all year round! There’s something so comforting about a good old fashioned banana cake, isn’t there? Have fun pairing this banana cake with different frostings and fillings too, like Chocolate or Peanut Butter Buttercream Filling. YUM! This tried and true scratch banana cake recipe is sure to become a favorite. Love Banana Desserts? Don’t miss these other wonderful cakes! 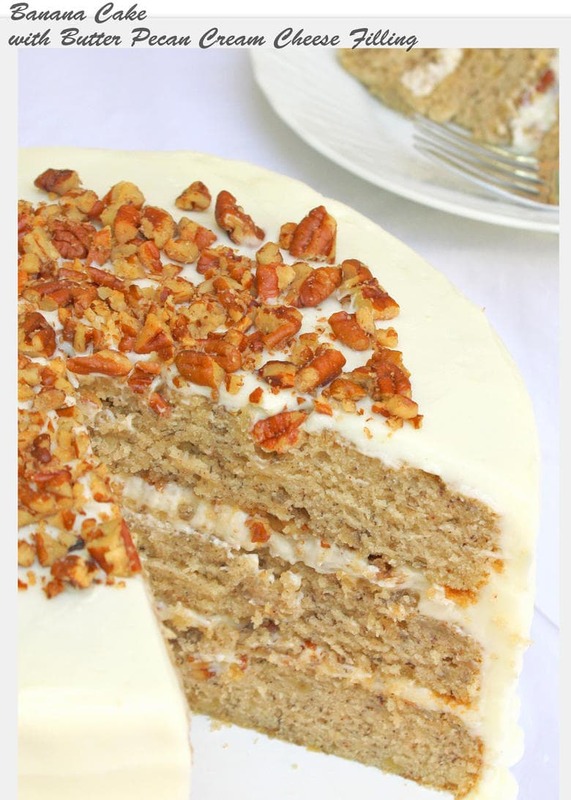 Hummingbird Cake is a southern classic with fantastic flavor not only from bananas, but also crushed pineapple, pecans, and a hint of cinnamon. Everyone loves this recipe! Banana Pudding Cake– Just as the name suggests, this recipe tastes exactly like banana pudding! Moist banana cake layers are layered with a whipped vanilla cream filling, crushed vanilla wafers, sliced bananas, and a luscious cream cheese frosting! This super moist and flavorful homemade banana cake is sure to be a crowd pleaser! Melt 3 tablespoons butter. When melted, add 2 cups chopped pecans and toss into butter to coat. Spread on a baking sheet and bake at 350 degrees for 6-8 minutes, stirring several times. Set aside for later. Preheat the oven to 350 degrees, Grease/spray & flour three 8 inch pans and line with parchment circles (or your prep method of choice). Slowly add the banana/buttermilk mixture to the dry ingredients beating on medium speed for 1 minute, scrape the bottom and sides of the bowl and beat another minute. Pour batter into the prepared pans and bake at 350 degrees for 25-30 minutes or until the cake springs back to the touch and a toothpick comes out clean. Cool the cakes 10 minutes on the rack and then turn out. In the bowl of your mixer, blend the butter and cream cheese until just combined. Add vanilla, with mixer on low speed gradually add the powdered sugar. Mix until smooth and combined. For the filling, take out 1 1/2 cups of frosting and add 1 cup of the buttered pecans, stir to blend. Spread between the cake layers, extra pecans can be pressed into the filling, if you like. The extra pecans can also be used to decorate the top of the cake. The remaining cream cheese frosting will frost the cake. Thanks for stopping by! Don’t forget to check out our collection of tried and true cake, frosting, and filling recipes in our Recipes Section! Or, if you are interested in learning more about cake decorating, check out our section of Free Cake Tutorials! Or, you can become a member of our site for access to our entire cake decorating video library. We’d love to have you! « Peanut Butter and Chocolate Cake!~ Recipe! Hi Sarah, If you are not using cream cheese in the frosting the cake will be fine to be left at room temperature. We think buttercream begins to have an “off” taste after 3 days. I only have two 8 x 2-inch round pans, so I made 12 cupcakes with 1/4 cup batter each and then used the rest of the batter for the two 8 x 2-inch round pans. The two 8 inch layers were only 1 inch thick. Do you know what caused this? I was expecting them to be thicker, like maybe 2 inches. Hi Jackie, I am sorry you had a problem with the recipe. Are you familiar with using the reverse creaming method of this recipe? Melissa has a video on this if you would like to watch it, here is the link link to mycakeschool.com. Cake layers do not rise quite as high as the conventional mixing method but they should have been approximately 1 3/4 inches high. Method is importing when using reverse creaming. Possibly the dry ingredients were not completely moistened with the butter. It should be mixed until the butter and dry ingredients look like coarse sand. The wet ingredients should also be added slowly to the dry ingredients. The recipe can be rewritten into the conventional mixing method of creaming the butter and sugar if you would prefer that. Fabulous recipe! I made this cake last night for dessert and was absolutely delicious. Hubby and I couldn’t wait for the coffee to brew this morning so we could indulge in another piece for breakfast. Try this recipe…… you will not regret it!! Hi Judy, I am thrilled you enjoyed the cake!! I like cake for breakfast too. Thanks so much for posting your thoughts!! I am making a curious george cake and was wondering what you think of the banana cake with mini chocolate chips frosted with a chocolate buttercream. Do you think a peanut butter buttercream filling would be overkill? Any other flavor recommendations? I am excited to try the cake recipie. Hi Courtney, I think what you have planned sound delicious, and peanut butter buttercream would be great! Do i need to use real lemon juice? Or can i use the lemon juice in the bottle. Or can i just leave it out altogether? Hi Nicole, I am not sure how concentrated the lemon juice from a bottle is, can it be used as an equal exchange? The lemon juice helps to keep the bananas from turning brown, but is not vital to the recipe. This cake is outstanding (especially the frosting). The buttered pecans are to die for. Hello, I only have 9″ baking pans at my home. Will the cake turn out the same if I use those or should I make adjustments to the recipe? Thanks! What is buttercream? Its the same that heavy cream?, can you give names of some brands? I live in mexico, and í want to know and understand what kind of product í have to buy, here can be diference. Hi Melissa, Can this receipe be frozen? Hi Marlene, Yes, the layers can be frozen for 2 to 3 months. Wrap in plastic wrap and aluminum foil to keep them airtight and they will be fine. When ready to use, keep wrapped until condensation forms on the aluminum foil then unwrap for them to continue to thaw. This cake is sooo good! So moist and flavorful. Your cream cheese icing is the same way I make mine. Absolutely delicious!